or making the green machine work again. 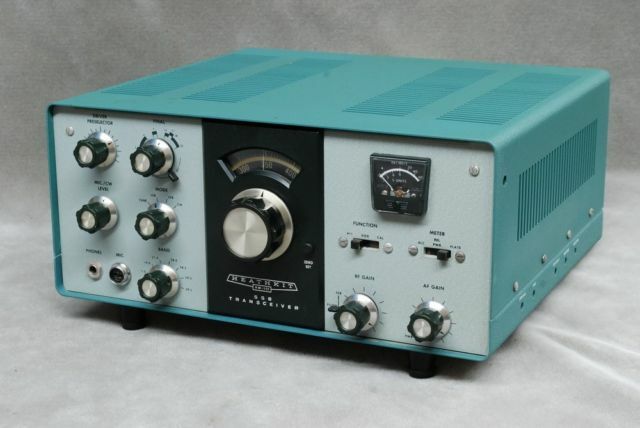 The Heath Kit HW101 was Heath's most popular HAM Transceiver. It was sold for nearly 12 years and evolved from the HW100. The HW series was a cheaper version of the better looking SB series but circuitry wise these radios are 95 % the same. In fact all of the circuit boards are identical. Some boards were not fully populated with components on the HW series radios to reduce costs. The HW series cabinet and mechanical parts where simple sheet metal and thus the mechanical fabrication was much cheaper. The tuning dial on the HW series however was superior to that of the SB series in my opinion. The main difference between a HW100 and a HW101 is that the 101 has a CW filter option. If you have a chance to purchase a HW series radio be aware that the 101 is the better of the two. However, either will work in SSB or CW with almost identical performance. That is to say just barely usable on today's crowded bands but still a lot of fun. These radios are available at a low price and also have a nostalgic following. I see a lot of these. The next pages will describe how I check out the HW101s plus give you some hints as to what to look for when you start your restoration or repair project. The HW101 is of course a tube type transceiver. It does have a solid state VFO and a few silicon diodes in the circuitry but 99% of the radio is "hollow"state. The transmitter final amplifier is based on a tried and true pair of 6146 tubes driven by a 6CL6. The receive is a dual conversion superhet with a 3.395 MHz crystal filter IF. As far as tubes go the only tubes getting hard to find are the 6HS6 and 6GW8. Even these can be obtained for a price. The 6HS6 can be replaced with the cheaper and ubiquitous 6AU6. This link will take you to the assembly manual and schematic PDF. HW101 Manual. The First Steps in checking out any "new" boat anchor is to do a visual inspection. The HW 101 is no exception. These have been around the block before and may have visible signs of failures or even some modifications. I usually inspect for burned circuit boards, most usually on the audio board and around the final amplifier tube sockets. After removing the top and bottom of the cabinet, I start my "no power" inspections. Since this is a Heath Kit, it is always good to inspect the solder joints both on the PC boards and on the point to point wiring around the final amplifiers. A clue as to the age and perhaps the state of the rigs condition can be found by looking at the two large electrolytic caps, one on the audio board and one on the generator board. If original these will be a brown color paper capacitor. I always change these out if they are the originals. There are three smaller electrolytics that should be changed as well. If you have an early model of the HW101, you may see a 10K resistor running from the IF board to the Bandpass Board. (V4 to V5). This resistor was replaced in later production runs with a Jumper wire. I always replace this resistor with a jumper if it is still present. Next I check the usual suspects, resistors. These radios use carbon composition resistors and they are now 40 plus years old. These resistors often change value and Heath had a tendency to cut the wattage ratings very close. Often a 1 watt resistor was dissipating 1 watt. The resistors are 10% to 20% tolerance but often the higher value resistors open or double in value. I usually check all of the resistors using a DMM or VTVM and replace any that read over 20% of their marked value. Since I do these measurements "in circuit" a low reading can be caused by additional circuitry and I ignore those for now. The HW and SB series transceivers both use the same low voltage regulation circuitry and the high wattage resistors on the audio board near the 0A2 tube should be checked. There are two 7 watt resistors, a 1K and a 2.5K that often open and result in a dead transceiver. If these are bad I replace them with 10 watt versions. Next check the 3.3K 2 watt resistor on the left side of the audio board. This resistor can change value and reduce the bias voltage to a point where the finals bias can't be set. On the IF board check the 22K 1 watt resistor. It may have been changed to a 33K, never the less it is a suspect and these can change value. I always replace these with a 33K 2watt version. Another resistor to check on the IF board is the 100K resistor just to the left of the V3 socket. I usually change this resistor to a 1watt 100K. On the bottom of the chassis inspect the final amplifier sockets. Look for a burned 100 ohm resistor that supplies screen voltage to the 6146 finals on (Pin 3). These are often bad or way out of spec. Also check the 2.2 Ohm cathode resistor as these can be stressed if the rig was out of tune for a long period during tune up or if a 6146 has failed. I also usually check the resistance between the 6146 control grid (Pin 5) and the center pin of the bias pot. It should read 10K. I have found many open. If you find an open look for a bad solder joint where the 10K and the RFC choke tie together. Now tubes. The HW101 uses a bunch of 6AU6 tubes and 6EA8 tubes. The 6AU6 is a pentode while the 6EA8 is a dual tube with a pentode and a triode in one envelope. In my experience these are the cause of many issues. The 6EA8 can become gassy or the triode section can become weak. I test all of these and replace as required. The same goes for the 6AU6s. As a note, if you have an emission tube tester, leave the 6AU6 in the tester for at least 2 minutes as these often test good for 30 seconds and then start to wilt. Once I have checked the resistors and the tubes and I am satisfied they are all good, I usually clean the pots and band switches with a little Deoxite. I also inspect the preselector shaft and pulleys to make sure that turning the shaft actually turns both of the variable capacitors. On the preselector both variable capacitors should rotate together and be in sync from stop to stop. Either rubber "O" rings or dial cord maybe used to couple the shafts to the capacitors. The rubber "O" rings can be purchased on ebay and at the Heathkit store. Often the shaft pulleys become unsoldered from the shaft and must be reattached. Now check the Plate Loading shaft to make sure it too moves the load capacitor inside the final cage. Check the plastic Plate Tune coupler also. These can become brittle and broken. With the final cage top removed check to make sure the plate caps and associated suppressers are not touching the cage or the rotator of the tuning variable capacitor. Also check to see if the plate caps on the tubes are still attached. I have seen dozens of 6146s with open plate caps. If you pull on the plate cap and the cap comes off well, that's another bummer. At this time it's also good to check the 6146s to make sure they are the same type. (A, B, W) Replace the cage top and never operate the rig without the top installed. There are a few diodes in the HW101's circuitry but only two that causes problems on a regular basis. First the 15 volt zener in the cathode of V12. This diode biases the VOX reply amplifier. It can short causing the rig to be keyed all of the time. Check this with a DMM on "diode" and make sure it is not shorted. Replace if necessary with a 15 volt 1 watt zener. Next is the Relative Power detector diode under the chassis near the antenna port. Look for a small glass diode near the Antenna relay. Check it for open or short. Replace it with either a 1N60 or a 1N914, or even a 1N4148 if necessary. Next I check the coil pack, to make sure all of the band adjustment coils have slugs that are not cracked or damaged. These are the adjustments that will be made during alignment and if the coils are broken or slugs are damaged the alignment can't be completed. While here, I also check the heterodyne crystals to make sure they are the correct frequencies. Some 11 meter operators change the 10 meter crystals out...what a bummer to find your 10 meter crystals are missing. Also check the 11 pin power connector on the back of the rig. Make sure it has a key and that the mating power supply cable can only go on one way. These pins can be hard to solder both on the radio and in the power cable plugs. Now is a good time to check the power cable pins for cold solder joints. Lastly I check the two pilot lamps to make sure they are #47 bulbs. These bulbs are part of the filament current balancing circuit and must be #47s to ensure all the tubes are getting the proper filament current / voltage. So with these checks completed it is time to put some power to the rig. If you have a HP23 model that has the front panel "low voltage select" switch, place it in the 300 volt position. If your HP23 is a newer version make sure the supply is wired for the 300 volt option. There is a small one terminal standoff inside the newer HP23, if it only has one brown transformer wire on the terminal it is wired for 250 volts. See the manual to select 300 volts. Before plugging the power supply into the AC outlet, connect a speaker and a dummy load and the power supply to the rig and place the HW101 right side up on a clean work surface. You don't need a microphone yet, so leave it disconnected. Make sure the power switch is in the OFF position, the mode switch in USB, and the RF gain is fully clockwise. Select 20 meters, place the meter switch in ALC and the PTT / VOX switch in PTT. Plug the HP23 supply into the AC outlet and rotate the AF gain control until the power switch clicks. You should see pilot lamps glow normally. A dim glow or an extra bright glow may mean tube issues, If the dial or meter pilot lamps glow very brightly turn OFF the radio and check for a missing or open tube or a tube with a cathode to filament short. If the pilot lamps glow normally look for smoke or listen for arching. Neither should be present...HiHi. Now we will make some basic voltage checks. Look to see if the 0A2 regulator tube is glowing a purple or bluish color. This is normal and indicates the 150 volt regulator is probably working. It also means you have at least 250 volts at the low voltage supply line. If the 0A2 does not glow suspect a power supply issue. For now I will assume all is OK.
Let the rig warm-up for a few minutes before checking the receiver. AGC check is next. With no signals heard on the receiver, the RF gain control fully clockwise , the meter in ALC, set the meter to zero using the zero pot on the right side of the radio. Now turn the RF gain control counter clockwise and observer the meter advance to full scale or more. If this test works AGC and ALC will probably work too. Now set the Filter switch to SSB and place the PTT/VOX switch to CAL. Advance the AFgain to a point where you hear a rushing noise in the speaker. Then tune the VFO until you hear the CAL signal. (14.200) Peak the preselector and note the S meter reading. The S meter should show S5 to over S9. If you can do this step the receiver is working to some degree. Now change bands and ensure that each band has a pre-selector peak, It maybe necessary to tune the VFO a little on each band to receive the CAL signal. If a band fails to operate, note it for later repair or alignment. On the higher bands the peak may be very broad and the S meter may only move a little off of the zero mark, as long as you hear the CAL signal this test passes. Assuming the receiver is working on 20 meters we can test the transmitter. Set the band again to 20 meters 14.200. Set the CW/MIC control fully counter clockwise. Set the Plate tune to 14 and the Plate Load to the 4 o'clock position. Set the meter switch to Plate. Now we will adjust the final idle current. Note the triangle mark on the meter face. We will be adjusting the bias pot on the right side of the radio to this mark. Use an insulated flat blade screw driver to adjust the bias pot. Place the mode switch in Tune, the Plate meter should show the idle current. Adjust the bias pot until the needle points to the triangle on the meter face. Once adjusted return the mode switch to USB. Next we will try to tune the transmitter for RF output. Place the meter switch in the "Plate" position, the CW/MIC gain fully counter clockwise. Peak the preselector for maximum rushing noise in the receiver speaker. Now with a dummy load still attached to the antenna port place the mode switch in Tune. Observe the Plate meter, the needle should be pointing to the triangle, slowly advance the CW/MIC control until the meter shows 100 ma of Plate current. Switch the mode back to USB. Now place the meter switch in the "Relative Power" position, set the mode back to Tune and quickly adjust the Plate Tune for max RF output indication. If all goes well you should have 30 to 50 watts of CW. Now lets test the Balanced Modulator. Keep all of the transmitter adjustments you just made. Connect a microphone or a shorting jumper that will allow you to key the transmitter via the mic plug. Set the PTT/VOX switch to PTT. Turn the CW/MIC control fully counter clockwise. The mode switch should be in USB. We will be adjusting the carrier balance pot of the top of the generator board. Turn this pot fully clockwise. The meter should still be in relative power position. Key the radio with the microphone PTT button, observe a power output indication. It may only be 10 to 20 watts. Now adjust the carrier balance pot to near its center position such that the RF power shows a minimum or zero output on the meter. Next turn up the CW/ MIC gain and talk into the microphone at a normal level. The RF power meter should swing up with voice peaks and drop to near zero when not talking. If this works the transmitter is working and you are able to transmit SSB signals. OK so that is the way its supposed to work, often it doesn't. I see a lot of these radios that are way out of alignment or ones that have defective carrier oscillator crystals or heterodyne crystals or even missing IF Filters. If your radio isn't passing the tests described above then use the manuals "in case of difficulty" section to start the troubleshooting process. If your radio has passed the tests above, then proceed with an alignment. Always check the transmitter neutralization before calling the job done. Now what about modifications. There are several improvements you can make to the HW101. These have been documented and I provide links to most of these below. Do not make modifications to your HW101 until you have the radio working normally. I hope this helps you get started on your HW101 restoration or repair. As always you can contact me via email if you need some suggestions or other help. Improving the Heath kit 101 Transceiver.